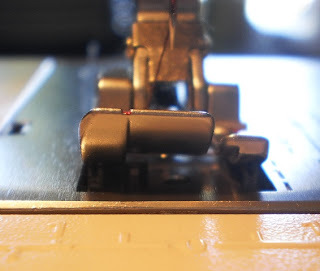 For those of you with Pfaff sewing machines, you might like to know about the Pfaff bi-level foot. I refer to it as a binding foot, because I can't imagine what else I'd use it for. But I love this foot.... For those of you who don't have one, let me show you how I use it to do the final top stitching on my binding. I only use this foot for the top stitching part of the binding process. 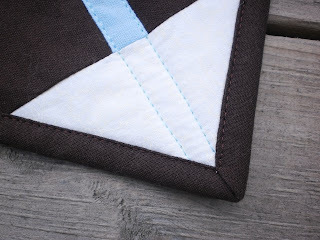 So after you have sewn your 2.25" bias or straight binding strip to the back side of your quilt, fold over to cover the seam on the top side of your quilt. 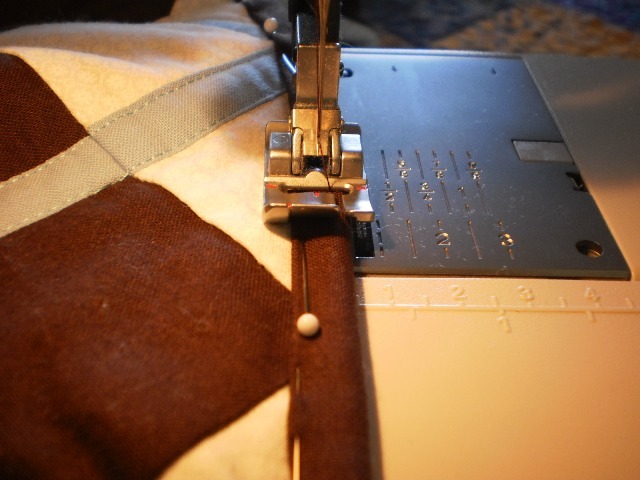 I pin with pins pointing toward the presser foot. I take them out as I come to them. First have a look at the foot. It's called a bi-level foot because it accommodates something that has two levels. The underside of the foot is deeply grooved. This accommodates the thicker binding strip. After snapping on the foot, if you look closely, the foot sits crooked. Two levels. I guess that's why they call it the bi-level foot. 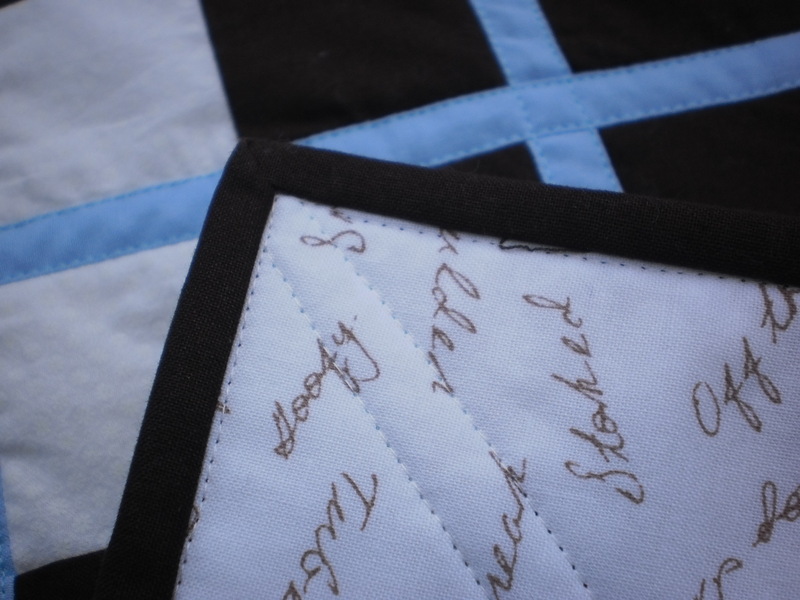 When you place your prepared piece for the final top stitching of the binding, the thick binding side is to the right side, and the inside quilt part falls under the left side. I keep the IDT foot down (or engaged). Now look at the piece closely, you will see that the foot is level. 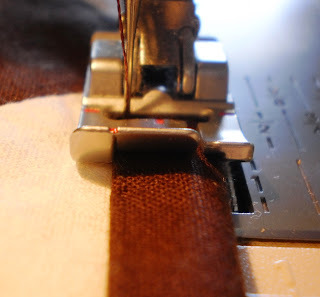 As you stitch, there is a small red mark on top of the foot. This mark lines up with the edge of your binding. The side of the lower level side of the foot, keeps it from shifting over. You now move your needle over to top stitch close to the edge. As you come to a corner, simply stop sewing with the needle in the down position, lift the presser foot, pivot the fabric, then lower the presser foot, and start sewing again. Here is what your topstitching will look like on your binding from the right side and the last picture shows what it looks like on the underside. Sometimes you have to just give it a try on a small project to get the hang of it. Let me know if you have any questions. Do I have one of these foots? I love binding, it finishes off things so well. 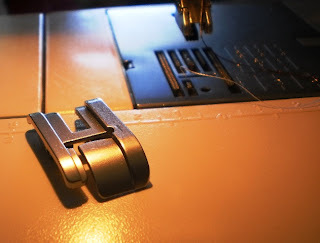 I think this foot would be the cats meow for doing binding on everything... if I don't have one, I will add it to my list of things I need... free motion.. bobbins and now a binding foot. oh, that's nice! Now I see why I need one. Thanks! Thanks. This is great information. I just bought this foot. Thank you for the great instruction. You make it look so easy. I am about to try it right now. Thank goodness! I've been having such a time trying to use the edge foot and never knew whaT this foot was for! Thanks! Game changer! I'm going to have to swoop on down to my dealer and see if they have one of these this weekend! Do you think this foot makes it easier to bind? Is it worth buying it? Thank you! Hamming it up - with fancy sleep pants.